Pulp Simpson Tee Design Review. 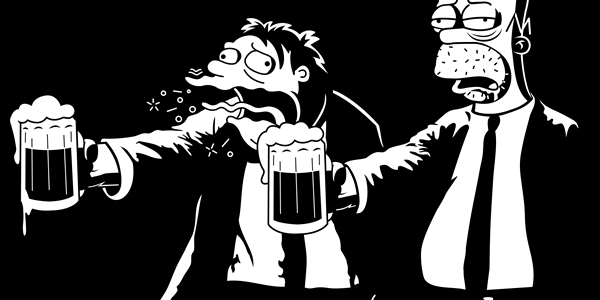 The MPulp Simpson tee design is for The Simpsons and Pulp Fiction fans. The concept is great. 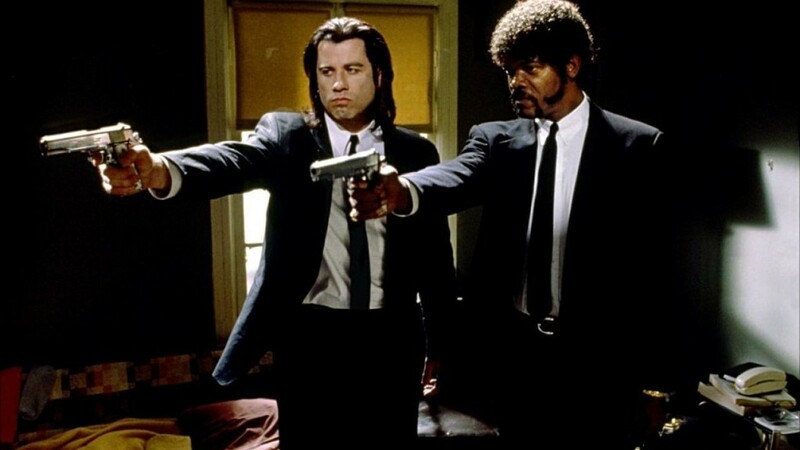 The Pulp Fiction characters of Vincent Vega and Jules Winnfield (seen above) are replaced by Barney Gumble and Homer Simpson of The Simpsons. This is one of the better Pulp Fiction parodies out there. The use of beer mugs rather than guns is what makes this such a great and funny tee. As for the artwork, there is no color, Just White on Black. It is a good rendering of the two classic cartoon alcoholics with their often used expressions. It has nice action with the spills, burp and drool. The design almost seems ...animated. While this is the Pulp Fiction pose it is definitely more of a Simpsons fan tee. 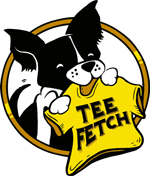 It is a great shirt for people that do not take life too seriously. Stationjack executed this design wonderfully as this is a believable scene that stays true to the beloved characters. Pulp Simpson Tee Design by Stationjack. Pulp Ricktion Tee Design Review. The Pulp Ricktion tee design is for Rick and Morty and Pulp Fiction fans. The concept is funny and true to the Rick and Morty characters. The Pulp Fiction characters of Vincent Vega and Jules Winnfield (seen above) are replaced by Rick and Morty. This is one of the funniest and best versions of the numerous Pulp Fiction parody/mashups out there. Though the art work of the characters doesn't appear to be original at all, like a straight rip from the show. It looks good. After all, the characters were not created by LavaLamp so not all of the creative credit can go to him obviously. As for the artwork, this one also adds a bit of color and references the devices of Rick and Morty instead of Vincent's and Jule's guns. However, while Rick's Portal gun does produce Green portals, Rick's laser gun that Morty is firing should be Red or Blue to stay true to the show's episodes. It's nice to see a cartoon version of the Pulp Fiction scene. Pulp Ricktion Tee Design by LavaLamp. Supernatural Fiction Tee Design Review. The Supernatural Fiction tee design is for Supernatural and Pulp Fiction fans. The Pulp Fiction characters of Vincent Vega and Jules Winnfield (seen above) are replaced by Sam and Dean Winchester of Supernatural. Concept wise the design works. 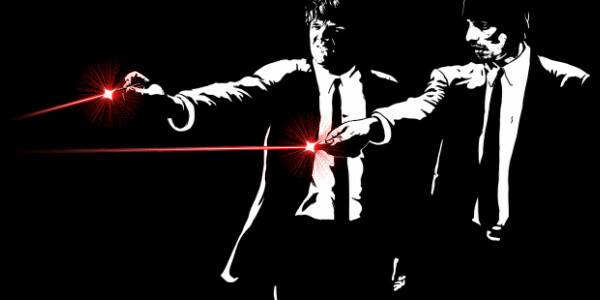 This is one of the best versions of the Pulp Fiction parody/mashups out there. There are countless other ones but this Supernatural one just seems to fit better considering it's not much of a stretch from the actual story plots. Both of the duos wear suits. 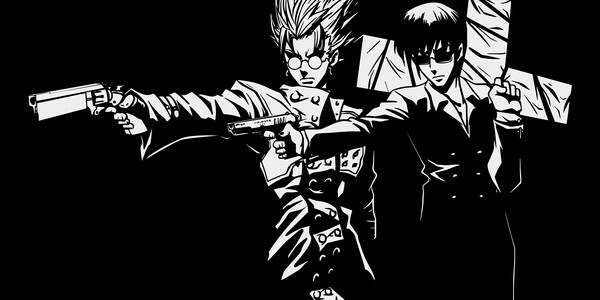 Both sets of characters wield guns and point them at all kinds of captives and hunt people and things down. And the overall attitude is shared by both franchises. While this is the Pulp Fiction pose it is definitely more of a Supernatural fan tee. The pose just has the right take no crap from anyone or anything vibe witnessed on the road so far. 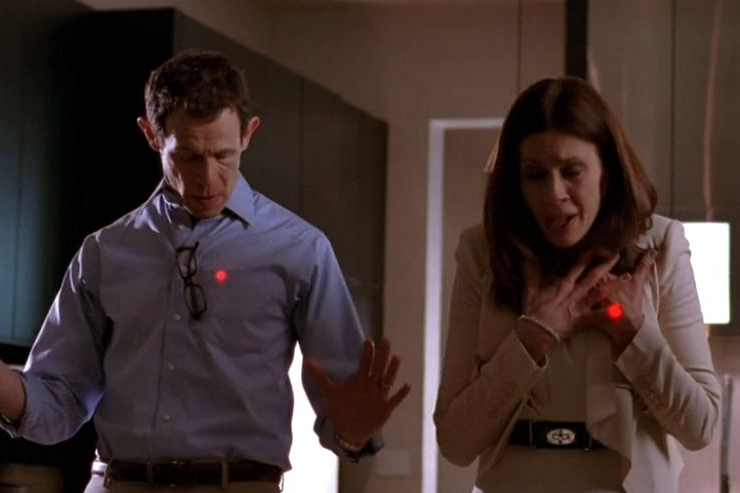 You just know they are aiming at evil. Ddjvigo executed this design well for as simple as it is, using the most basic of Photoshop skills. Often "simple" works best. Yes this violence themed design is available on children's tees too even though it is not appropriate for kids. Use your own judgement. Supernatural Fiction Tee Design by ddjvigo.